theatre | Damian Trasler's Secret Blog - Do Not Read! Finding a way through the woods.. This week has been a little busier than most, since Mrs Dim launched off to the UK with Tiny Weasel for a whistle-stop pre-Christmas visit. There was a lot to organise before they left, and, strangely, even more to organise once they’d gone. But despite the pressures of laundry, cooking, shopping and work (all of which, now I come to think of it, I was doing anyway) my latest play* “Under the Hood” was published by Lazy Bee Scripts. The play is about Rose and her husband Mark. Mark works at a job he hates, because he has a heavy workload that his boss doesn’t understand. Rose is an aspiring actress, and she’s just secured a role in a small production that has a lot of prestige attached – it’s directed by theatre legend Cain, a man so awe-inspiring that he’s known by just the one name. This could be the start of big things, even though the production is a new interpretation of “Little Red Riding Hood”. Things come to a head on Rose’s final night in the play, as the couple finally find their way through the woods and come out on the other side to face the future. You can read the complete script here. *It’s not the latest I wrote, just the latest published. I wrote it, but it had some issues, and in between writing it and rewriting it, I wrote another play and it got published first. THAT’s my latest play, chronologically speaking. Maybe I shouldn’t have tried to explain. Here we are, back at the start of another school year. (At least it is in the northern hemisphere; I have lost track of the way these things are managed in the antipodes.) For anyone planning their theatrical season, this is a reminder that we have a variety of seasonal plays including entertainments for Halloween, both religious and secular Christmas shows and a huge variety of other material for schools and youth theatres. Of course, it’s also the run-up to the panto season, and again we have vast numbers available. If you’re looking for something specific, try our pantomime pages or the search engine. 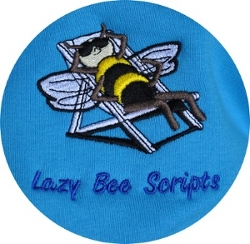 If you’re in a hurry and need a short-cut to our best sellers, then follow the “what’s hot” link from the Lazy Bee Scripts home page. Comedy sketches and short plays. (The plays may also be comedies or may evoke a broader spread of emotions.) Each runs to less than 20 minutes, by our estimate. However, it’s worth noting that our reckoning is wrong! It’s based on word count, so it judges all plays in the same way. This is fair, but in practice the timing will vary enormously. Someone made good use of our script feedback (via our Contacts page) to tell us that their production of Two Surgeons (by Damian Trasler and Steve Clark of TLC Creative) ran at 4 minutes, not the 10 minutes that we suggest. In that case, it’s very close to stand-up comedy – high rate of patter and little action – so we will tend to overestimate, whereas for plays with movement and dramatic pauses, we may underestimate. Two Left Feet (1M, 2F) follows 40-something Joy, who has turned up at her sister Carole’s place following a divorce. While Joy sags about on the sofa looking joyless, Carole enjoys a fulfilling life in the ballroom with new boyfriend Steve – but is he really the romantic he’s cracked up to be? There’s plenty of life left in Sid, although he’s approaching his eightieth birthday, though life becomes difficult in Baggy Trousers (1M, 1F) when patronising new carer Melanie arrives. A once-popular children’s author takes solace in a letter from her last surviving fan in Out Of Print (1M, 1F) . Jonathan Edgington’s I. Guy (1M, 2F) explores futuristic friendship. Veronica and Courtney spice up their ailing relationship by bringing Carlos into the fold. This is much to Courtney’s chagrin – until she discovers that Carlos is a robot. The Love Potion (1M, 1F) is sold to Jennifer by a mysterious shopkeeper. She hopes to use it to save her tangled love life, though the elixir yields unexpected results in Robert M. Barr’s short play. A salesman tries to buy a second hand car and ends up considering taking a second look at his chosen career. A Second Hand (1M) by Lucy Cooper was originally published in 2009, but has been re-jigged to keep up with these enlightened times. “Abandon Ship” (2M, 1 Either) cry the passengers on Fred and Ernie’s ferry – but their prevarication and bickering leaves the duo vulnerable as their vessel sinks. A sketch by Robert Black. Dana Davies’ Date Night (2M, 1F) can’t be explored in too much detail without upsetting the school email filters – needless to say, raunchy misunderstandings and ill-prepared schemes abound. Two new musical pieces, both aimed at schools (probably the upper years of primary school and the lower years of secondary school, respectively). What The Dickens! (8M, 3F) is something you might exclaim upon viewing Andrew Yates’ latest work for children – a madcap musical medley through Oliver Twist, Bleak House, A Christmas Carol and more. This includes some feisty encounters, as Charles Dickens comes face to face with some of his less desirable creations. Nicholas Richards writes a wide variety of material for the stage; mainly, though not exclusively, for schools. Some time ago, we published his play A Tale of a Nail, much of which occurs inside the human body – an anthropomorphisation of the immune system’s response to attack. He followed this up with a musical version (probably aimed at the junior years of secondary school), which we’ve just published as A Tail Of A Nail – A Musical Play. In this case, it’s a play with four songs (and some incidental music); another of Nicholas’s musical offerings (this one in conjunction with Timothy Hallett) is a stage version of The Lambton Worm which is a single continuous piece of music running throughout the show. Effectively, it’s acted to a sung narration. We published that some years ago and we’ve just added a demo recording of the whole piece and an updated backing recording. Stephen Mercer gives us the alliteratively titled Llandudno, Lust and Lollipops (1M, 1F) – unless you’re using the proper Welsh pronunciation, that is. Charlie and Annie’s marriage has become humdrum, such that Annie finds herself experiencing fantasies of a more exciting life. The pair unwind forty years of strained politeness to discover that they both have more in common than they thought. The Night Nurse (2M) greets Greg after he wakes up in a hospital bed following a car crash. When he encounters the eerily familiar day nurse, Raymond, Greg soon realises that things are a little odd. A tense one act drama from Louise Wade. Take The Turing Test (3F, 1 Either) if you’re after a festival-length drama, the latest from Stuart Ardern. Alison Grove, an Artificial intelligence researcher, is struggling to cope with her mother’s Alzheimer’s disease when she should be focused on the question of whether machines are capable of rational thought. Jenny knows that John’s Mother (3F), Diane, isn’t her biggest fan. When the put-downs and asides get too much, she confides to her best friend that she’d love her out of the way. When Diane unexpectedly dies, the real trouble starts in Helen Boyce’s new drama. The Importance Of Being Belinda (6F) follows the feminist Sapphire Theatre Collective in their final rehearsal for ‘The Importance Of Being Earnest’ – though Wilde’s original has been revised and updated to cater for a female cast and political correctness. A witty one-acter from John Garforth. Paul John Matthews’ Café Fear (3M, 3F) is a drama with elements of tragicomedy. Two newspaper reporters, Angela and Jim, are following up reports of an escaped patient from a local secure mental hospital. Stopping off at a café, they are soon joined by a cast of bizarre characters, and mutual suspicions grow when their backstories become increasingly unlikely. A Change Of Heart (4M, 7F) comprises a tale of deception and murder in 19th Century Manchester, the latest enrapturing historical drama from Tony Frier. When Mrs Chiltern unexpectedly returns home one evening to find her husband dead, little does she imagine that she will be the one facing the gallows. School staffroom strife in Damian Woods’ The Primary Candidate (3M, 4F). Headmaster Gordon Lewis has called an extraordinary staff meeting, but has excluded one department in doing so. He announces a forthcoming VIP visit along with the vacancy for Assistant Head, causing much lively discussion and rivalry. Get your Christmas play shopping done early with I Don’t Think I’ll Be Here Next Christmas (1M, 3F) by Dawn Cairns. Cantankerous pensioner Jean always spends Christmas with her son John and his wife Sheila. The mutual dislike between Sheila and Jean bubbles under the surface, and threatens to boil over after an incident involving sixpences in the Christmas pudding. The two acts of David Pemberton’s Doppelganger are now available individually as one-act plays. Deception and Disguise (7M, 4F) were inspired by the plays that in turn inspired Shakespeare’s A Comedy Of Errors and Twelfth Night respectively. Jane Eyre (5M, 9F) has been adapted from the Charlotte Bronte novel by Richard Hills. The story of Jane, who takes the position of governess of Mr Rochester’s young French ward in 1846, is faithfully transformed into a stage piece. More early-bird festivity can be found in Jamie Lakritz’s The Great Christmas Cracker Heist (5M, 6F, 1 Either). Everyone at the cracker factory is looking forward to their seasonal bonus – But things aren’t going as well as they seem at the company, so the staff take steps to get the money they’re banking on. Mike Warrick’s spooky comedy A Wake All Night (5M, 5F) takes place in the mansion of late billionaire Sir Roger Laughton. Following the eclectic businessman’s funeral, several select guests are invited to try and spend the night at his haunted abode. But why these guests in particular? Similarly ghostly is Nothing Old, Nothing New, Anne Graham’s single-setting farce. Valerie is dead but unable to leave her house, now occupied by her son and his wife Zoe – the cause of her fury and her enforced sit-in. Her grandson arrives to find his mother making plans for his sister’s wedding – though scandalous revelations soon scupper everyone’s plans. White Rock (4M, 4F) is the publishing firm in Martin Ward’s thriller, where autocratic owner Sir James Bannerman has just been found murdered. Inspector Hilliard has his work cut out to find the culprit, given that everyone at the office had a compelling reason to commit the crime. We can confirm that no such dramatics occur in real-life publishing houses. 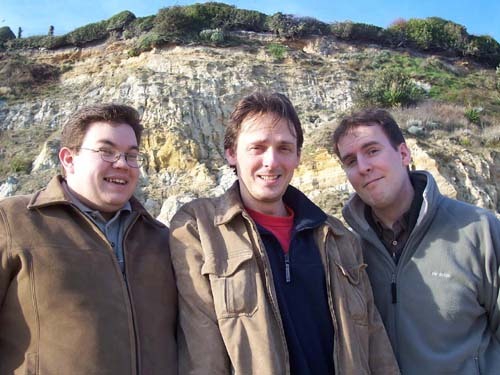 Sheer Luck Holmes was produced by the Apollo Players (on the Isle of Wight). A picture of their dancing policemen appears on our web page for the script. Bob Heather and Cheryl Barrett have remastered Sheer Luck Holmes (1M, 5F, 13 Either). All of the familiar panto ingredients and faces bound together to solve the mysterious case of the missing art works. Holmes is assisted by his housekeeper Dottie the Dame and Baskerville the pantomime dog. A new take on Cinderella (4M, 4F, 10 Either) takes the audience from the Job Centre to the Palace via Hardup Hall by a rejuvenated Fairy Godmother and a talking parrot. The Ugly Sisters are addicted to Facebook, while Prince Charming runs his life according to his fitbit. Best-selling author Robert Scott takes on the world of panto with Adrian – The Alternative Pantomime (5M, 5F, 1 Either), available in both clean and not-so-family-friendly versions. Adrian’s not your typical inhabitant of Pantoland. He’s level-headed, and can spot the difference between a wolf and a Granny. But due to unfortunate circumstances, he’s tasked with the role of Fairy Godmother – for everyone! Stewart Boston goes all Greek with Antigone (4M, 2F, 2Either), a dramatic retelling of Sophocles’ tragedy – perfect for secondary/high schools and youth theatre. Continuing the ancient theme, Graham Milton offers us two short plays, ideal for school assembly pieces: The adeptly-named Troy Story (6M, 2F) is a comic take on the story of the Trojan War, featuring a rapping and bloodthirsty chorus to keep the audience up to speed. Oedipus – Swollen Foot (8M, 3F) similarly provides a remarkably light-hearted and accessible take on a Greek tragedy. Lou Treleaven’s Absolutely Aesop (3M, 1F, 14 Either) may prove ideal for those looking to stage a family-friendly one-acter. As part of the series of Absolutely Ancients, the eponymous author is brought onto a chat show to discuss his most famous fables, and meet some of the characters again. Feline fanatics may take to Louise Wade’s It’s A Cat’s Life (1M, 3F, 3 Either). A group of cats are introducing the latest kitten to life on the lane, when a stray offers a differing view of humans and their houses. Before any conclusions can be drawn, the kitten gets into danger and needs rescue. Chariot (4M, 6F) by Chad Bearden was written for two young principals (and could be played by a youth company or a mix of youth and older actors). Lenny and Margo are left orphaned when their mother dies, but their Uncle Joe sneaks them away from government care and takes them on a wild and imagination-filled road trip. Detective Inspector Ben Cleveleys bobs in and out of the action in Richard Adams’ An Inspector Pops In (4M, 4F). Ageing actor Gary’s estranged wife is plotting with his entourage to systematically drain his bank balance. When Lisa, a young reporter from the local newspaper arrives for an interview with Gary, she becomes privy to conversations which threaten to uncover the whole plot.